As a member of the Association of Independent Technological Universities (AITU), RIT is among the world’s leading technological institutions. RIT was recently ranked in the top 40 “most technologically advanced” universities in the world. Today’s program portfolio boasts award-winning programs in a host of nontraditional disciplines—in film and animation, industrial design, sustainability, photography, medical illustration, microelectronic engineering, packaging science, museum studies, and diagnostic medical sonography. The RIT portfolio is among the richest and most diverse in the world. RIT is a world leader in experiential education. Our cooperative education program is the fourth oldest and one of the largest in the world. RIT is one of the largest private universities in the U.S. based upon full-time undergraduate enrollment. With full residential campuses in Dubrovnik and Zagreb, Croatia, in Kosovo, and in Dubai, our global presence is far-reaching and unique. 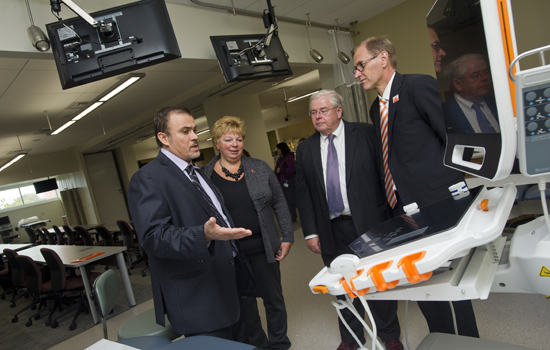 RIT’s growing research portfolio includes unique interdisciplinary centers such as the Center for Applied Psychophysiology and Self-Regulation (a program integrating education, research, and clinical care around the autism spectrum); the National Center of Academic Excellence in Information Assurance/Cyber Defense Education; and the Image Permanence Institute (a world leader in artifact preservation). The new Wegmans School of Health and Nutrition is based upon the premise that anticipating public health concerns is more effective than reacting to them. RIT’s sustainable architecture program is among the first to consider sustainability as a curricular element equal in importance to design. RIT sustains the sound fiscal policies that have enabled its remarkable growth and stability. RIT commits to carbon neutrality, LEED-certified buildings, and sustainability-focused degree programs. In 2014, RIT was named “the nation’s geekiest campus,” a distinction we embrace with pride.